1st Official VS Tourney in SG! - Sparkling Victory! 1st Official VS Tourney in SG! 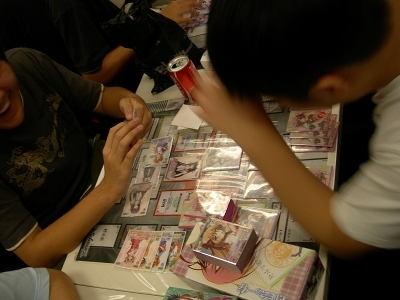 I know it is a little late (as usual), but Singapore had it first "official" VS tournament on 15 August 2010, held at The Card Geeks (TCG)! Some photographs were definitely taken on that day by the TCG crew, so I was hoping they would send those photos to bushiblog. Unfortunately there's still no news of it up to now. Luckily for me (? ), I brought my own camera to the venue, and snapped a bunch of (poor-quality) photos. (above) Marriage Royale VS Seitokai no Ichizon? (above) Definitely different players, but a sense of "deja vu"? The PR card for all participants was CB/P08 Ren & Jeen. Zelfi and I were at the tournaments as regular participants too. 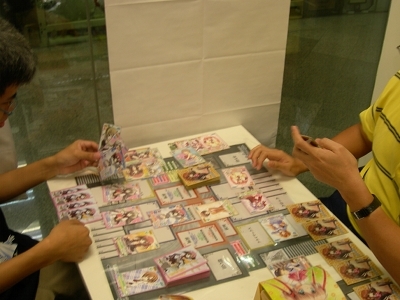 I played my newly-acquired Maburaho deck, while Zelfi had his usual (and upgraded) Imouto-standard deck. It was a 16-players tournament, and the first round already had the both of us pitted against one another. With other strong and outstanding local players around, as well as a string of bad luck on our side, both of us each merely pulled a 2win/2loss record. Overall, the first official VS tourney was a fairly good experience - even though our survival in the first VS SG tourney ended up being rather short-lived. Definitely hope to see more VS SG players around, and see if you can spot any of us at the upcoming A.C.M.E II event later this month! !